Six on Saturday, June 16. Here we are! It's Saturday again, and I'm joining in with the Six on Saturday crowd to see what's happening in gardens near and far. If you also have a hankering to see what's going on in other gardens, do visit The Propagator's blog where you can also join in if you wish. It's worth it. While we, in the Southern Hemisphere head towards the coldest time of the year, in the Northern Hemisphere gardens have burst forth into glorious bloom, and SoS pages are full of wonderful flowers, some familiar and some not so. One: Rescued from an orphans' table somewhere recently, this Gaillardia 'Mesa Red' is growing well. I'm not keen on the yellow ones, but I rather like this one with its bewhiskered centre and scarlet petals. Two: Seeds purchased from Lambley Gardens and Nursery: Cerinthe major purpurascens, Nigella 'Miss Jeckyll Alba, Nigella orientalis 'Transformer' and Wallflower Sunset Series 'Apricot'. These are intended to be space fillers in the garden. In the small packet I have Exochorda macrantha 'The Bride'. I saw Exochorda on a blog earlier this year and not surprisingly decided I had to have one. I’ve not found any online anywhere, but managed to source some seeds. I'll pot them up soon and hopefully have some seedlings before too long. Three: Here I have two cuttings of Grevillea 'Sooper Dooper' which has a terrible name, but is an excellent plant which flowers ALL year, and remains compact, making it especially suitable for small gardens. In the red, there is a cutting which I think is going to fail, but in the yellow is one that has new shoots on it already. Below is a photo of the flowers on the one that is already established in the front garden. 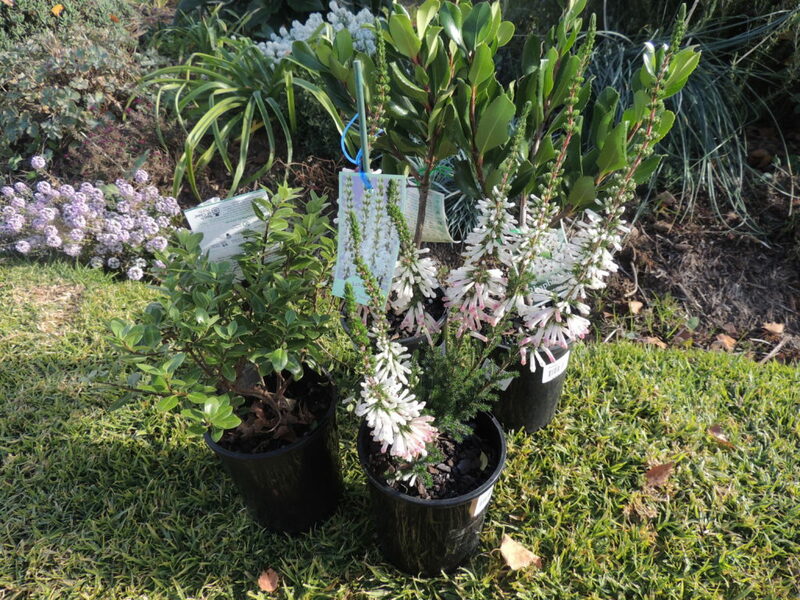 Four: Some purchases made on my trip home from Sydney earlier this week: a pretty Erica colorans 'White Delight' (flowers below) , a Pittosporum to fill a hole in a hedge and two dwarf Rhaphiolepis to put in the spot vacated by the bay trees which were moved a week or so ago. New larger pots have been purchased and I hope the Rhaphiolepis don't outgrow them too quickly. They were chosen for their toughness as the position they're going to be in is challenging indeed. The Five: I'm looking for help with this one. I picked this cutting from someone's front garden, but I don't know what it is. It had a blue flower and I'm wondering if it's borage. It has struck very easily and quickly. Any suggestions? 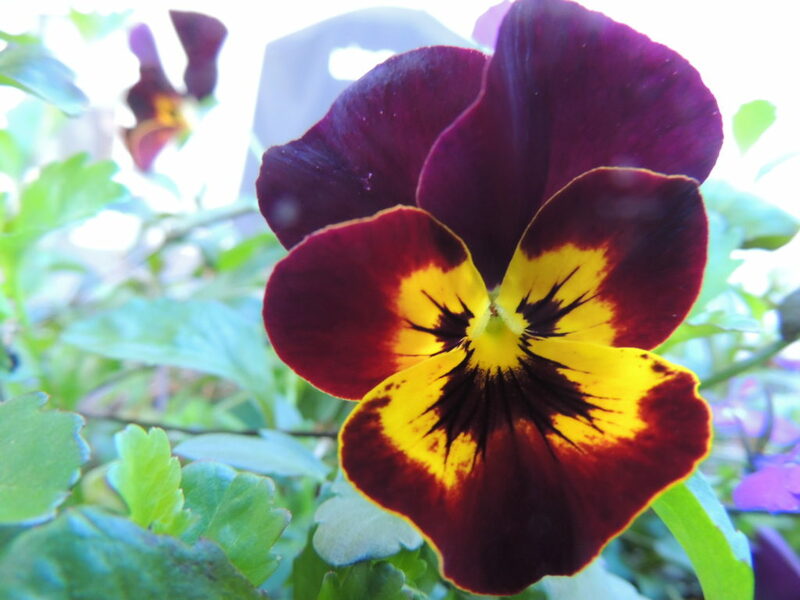 Six: Continuing the unsung hero/heroine series, this little pansy has self-seeded and is flowering happily in the cold and frost. Pansies grow well here in the winter, but as soon as hot weather arrives they throw in the towel. Fortunately they proliferate quite well and reappear when they are ready. That's my six for this Saturday. Happy gardening everyone. Weather today: -1 to 13 degrees C; windy, cloudy and cold. It’s always so exciting to buy seeds and new plants, isn’t it? I love the way gardens change and evolve all the time plus of course the impact of those gorgeous self-setters! I’m just planting out little pansies here, a bit on the late side but it’s been that kind of season. Your mystery plant certainly looks like borage although I’ve never heard of it growing from a cutting before. It’s one of my very favourite plants but is completely shameless at spreading itself about. Happy planting, Jane! Oh dear Lis, I don’t like the idea of shameless spreading! It will be good for bees though, I believe. Yes it is exciting buying new plants, and I don’t seem to be able to stop myself doing it! 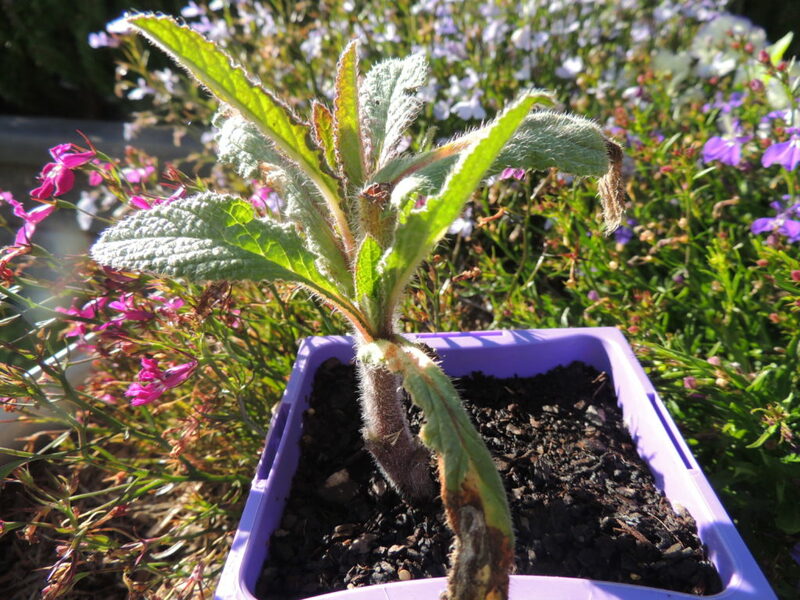 Borage is often grown from cuttings which can actually turn out easier than propagating from seed. Whilst it can disperse seeds up to 4 or 5 feet from the parent plant, the young seedlings are very sensitive to frost so unless you have a continually warm climate around germination time the weather will keep the numbers down. They will also fail to germinate well if the soil dries out. And of course there’s always the hoe. The bees REALLY love it which is why you’ll read advice not to plant it too close to your home’s doorways or windows that you may want to leave open! Thanks for that advice, John. Continually warm is pretty much what we have from the end of September onwards… maybe a rogue frost a couple of mornings in early October, so we should be ok. Time will tell. Love that erica, the flowers are beautiful! Yes, Mr P, I think it will be a good addition to the garden. The South African heathers are tantalising close to being growable here, they grow them on the Isles of Scilly, just offshore. So beautiful. I grew Grevillea semperflorens for a good few years, which was similar to your ‘Sooper Dooper’ (Who thought that was a good idea for a name?). That flowered all year too, hence its botanical name. I’ve done a little bit of research, Jim, and I discovered that Grevillea semperflorens was actually found in a Plymouth garden in the 1920s! Now that’s a surprise. Thanks Derrick, that’s probably what it is. I don’t know about the Gaillardia Fred, I’m hoping it will last through the winter. I had better collect some seeds in case it doesn’t. Thanks Gill. I’m sure if you can’t find that particular Grevillea there’ll be something else that’s suitable. They do respond well to pruning if they get too big and it’s great to have something that flowers in the depths of winter! That white one looks quite lovely, Jane. It is so nice to have some colour in Winter. Our vote is for borage as well. You will soon tell when it starts to flower. I don’t find it particularly wilful. Our climate seems to keep it under control. We pulled ours out ages ago when we were re-designing. It pops up every now and then. Thanks Tracy. It seems as though Borage won’t be too much of a nuisance, and the frost will keep it manageable. So exciting buying seeds – I have always wanted to try the white Nigella, maybe next year. Yes, I’m looking forward to seeing them appear in the Spring. No 5 is borage, but does that grow in your neck of the woods? It should do, Cathy, as I picked it from a garden here in town. I think I should put my cutting in my little greenhouse though, because it sounds as though it won’t like frost too much. As to the pretty blonde- I’ve no idea who she is either. Doesn’t she appear when you make comments on other posts? Am I the only lucky one? I am still mystified by the pretty blonde who appears next to my comments only on your blog. She certainly isnt me, I wonder who she is? I love the red gaillardia, I’ve not seen one like that before. Are grevilleas easy from cuttings? I must give it a try. I’d have to say the Grevilleas were easy Chloris, because all I did was put them in potting mix and keep them damp, and I have done this with other natives as well.Autumn is the best time to do it. I didn’t know gallardias came in red. It’s a beauty. They do come in red and also double. In fact there’s quite a wide variety, I’ve discovered. I’d love to get some others. I have such a horrible record with seeds from a packet…….for whatever reason. I can grow Morning Glories and Moonflowers and that is about it. I planted zinnias and then pulled up the little shoots thinking they were weeds, before I looked at the tag and realized I had planted seeds there…………I still want to travel to Australia, everything is so different there! Maybe 2020, my big anniversary! I’m not very good with seeds either, ( between you and me, I’ve been known to just fling them around the garden) so it will be interesting to see how these ones perform. Yes, you should put Australia on your list! I have just started collecting seed from Cerinthe and such like, whereas you are buying it to sow. That’s living on the other side of the world for you. Stay warm, Jane. Thanks Tim. Very unpleasant today (now Sunday), a day for staying inside. The variety of gardens and countries makes SoS really interesting. Too much Abba, that’s good, Jude. Grevillea might grow for you if you have a well drained spot. That one isn’t bothered by the frost either, although I think perhaps you don’t get so much frost where you are. A happy week to you too! You might just find that the Cerinthe are best sown direct in the ground. All the ones I’ve ever sown in pots to transplant have been weak specimens but luckily strong enough to seed themselves around, always producing strong plants. Sometimes they germinate quickly and I have flowers at Christmas other years they flower in spring. Good luck with ‘The Bride’, I bought one this year, it has fabulous flowers. Hello Christina, thanks for the advice about the Cerinthe, I wondered if that might be the better option. I’m really excited to get those Exochorda seeds. Fingers crossed! The color of Grevillea ‘Sooper Dooper’ looks similar to my ‘Superb’ – a smaller version of that plant would be wonderful. I’ve never tried propagating Grevilleas from cuttings but perhaps I’ll follow your example (although I’m probably already out of space for any of the larger varieties). 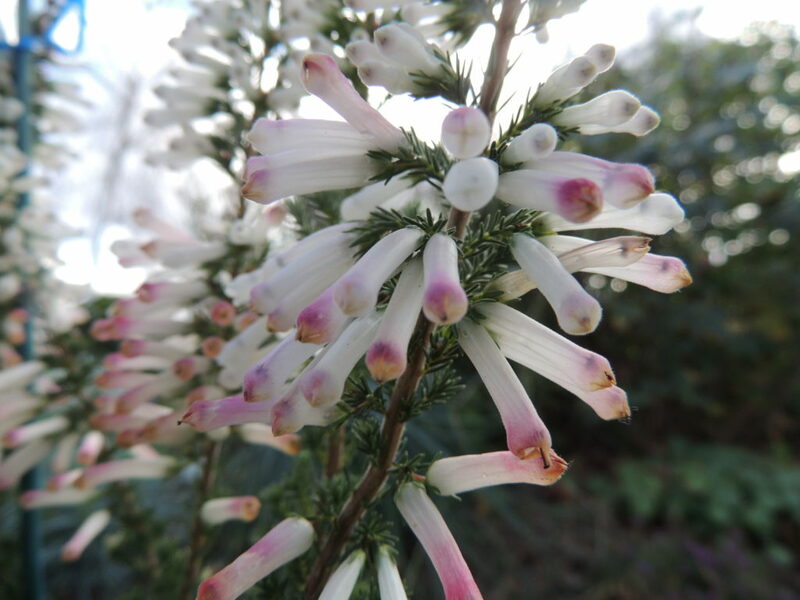 Your photo of the Erica is nudging me closer to trying one in my garden – it’s not a genus I’ve ever tried but I saw the plants growing well in Santa Barbara County to the north where the conditions are similar. Hi Kris, ‘Sooper Dooper’ could well be related to your ‘Superb’ as I’ve read that it was crossed and re-crossed a number of times during the propagation process. The best time to take Grevillea cuttings is in the Autumn, and they might sit in the pot for months before they do anything. I was quite surprised that mine took so quickly. Ericas are lovely- such a wide variety of charming flowers and worth trying in the garden. Yes, the leaves look like Borage to me also. Love the Grevillea ‘Sooper Dooper’. Looks a little bit like Grevillea ‘Peaches and Cream’ which is a favourite of mine. Hope your weather is a bit better than ours down in Melbourne – 100% rain and possible hail – very cold and wet. I notice the Weather Bureau reports huge snowfalls and storms up in the Alps, so looks like a good ski season to come, at least. The two Grevilleas could well be related, Vicki. The weather is awful here today, some showers, very light, but the temp has only reached 7 degrees! A day for indoors. Jane, Pansies are winter plants here too, days are unusually cold lately and there were some frosts earlier than usual ¿ do Peonies grow well in your area? Sorru for bothering with this question but there are not many southern hemisphere bloggers who garden in a climate like mine. Have a wonderful sunday! Hello Marcelo, nice to hear from you! I have had no luck with peonies, but there’s really no reason why they shouldn’t grow here. I have one in my garden. Last spring it grew some leaves, and then the weather was so hot and dry, I think it gave up. I will have to wait now, until October to see if it does anything this year. I think it all depends on the climatic conditions which have been a bit extreme recently. Jane, thanks for your kind answer. I have a peony “Alexander Fleming” in my garden, it’s been here for two years and I have exactly your same problem: it grows leaves but when the climate gets hot it stops growing altogether. This fall is being unusually cold I hope it helps my peony to grow, cold winters have proven to be good for my roses, whenever the winter was cold with frosts my roses grew stronger and bloomed more than they did in years with mild winters, roses appreciate a good winter rest. Have a wonderful week! Love that Erica. And the Sooper Dooper is great but why people have to give flowers such terrible names is beyound me. I think everyone agrees about the name! Your number 5 could be verbena bonariensis? Also, I love the gaillardia – so cheerful. Thanks, Anna. We have extremely strict restrictions here and I doubt that I’d be able to import plants. Fingers crossed that the seeds take! Love the grevillea sooper dooper. Huh how did I miss your post last week! Sorry! 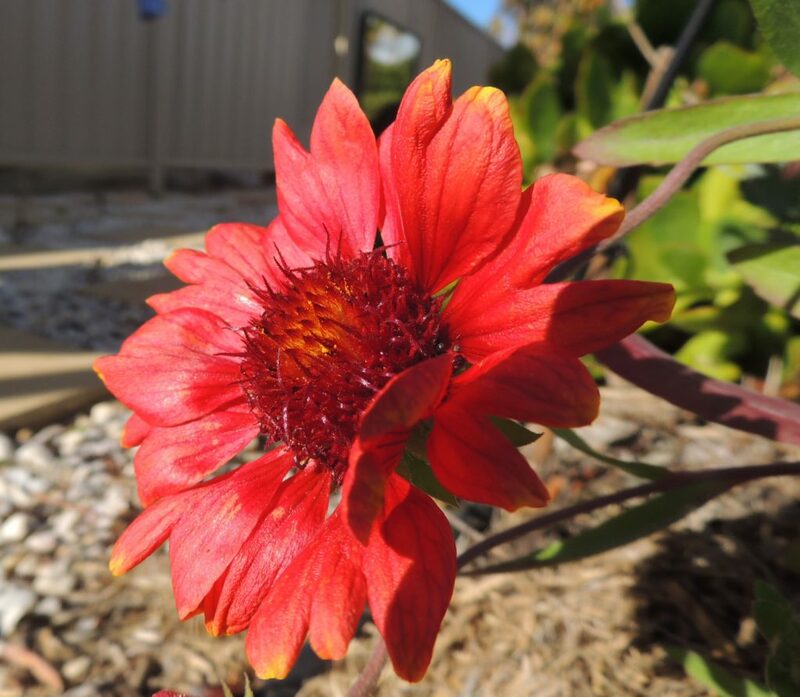 I am in love with the red gaillardia! We’ve only got the dwarf orange/yellow one “Goblin” but now I know there is a red one I’ve got hunting to do 😊😊😊. No six for this week? Rather strangely, your comment went into my spam, Nat, and no apologies for missing posts necessary. SoS has become so popular that it takes ages to get through everything. I’m very pleased with the Gaillardia too and a quick search informed they come in a wide variety of very nice designs. I have never seen them in nurseries so it might have to be a seed search to find some more. I just didn’t have time to do a six this week, but will be back in the fray next Saturday. There’s a lot of spam about perhaps I started my reply with “what?” hehe. Seed search sounds like a good plan. I wonder what the Diggers Club has? I’m trying various cuttings this year, too; with various results!